5 Reel, 25 Payline video slot featuring Free games and 2 random Progressive Jackpots. This game has very strange sea creatures such as a barking shark and a snarling snail! Players will hear a catchy country and western tune which is rather odd for an ocean theme! Certainly many oddities to be found here with many winning features! Barking Shark, Grumpy Lobster, King Cod, Snail riding a Seahorse, Spiked Crustacean, Flying Fish wearing pilots Goggles and a Pearl. 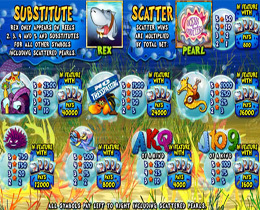 The poker icons include Q, K and A.
Rex will only appear on reels 2, 3, 4 and 5. The Wild substitutes for all other symbols including the Pearl Scatter symbol. 2 or more Pearls or Shark/Pearl combinations award a payout. 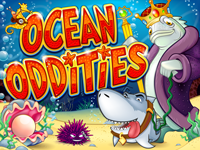 3 or more Pearl or Shark / Pearl combinations activate the Free Games feature with 16 Free Spins. Each Shark symbol awards a 2x multiplier. Coin sizes range from 0.01 to 10.00 per active line. Play all 25 lines and bets will range from 0.25 to 25.00 per game. 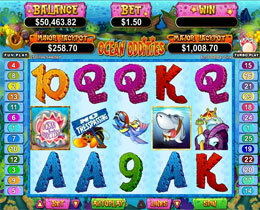 Major Jackpot which begins from $1 000. The imagery is amazing with the background of coral, sea plants, ocean floor, shipwrecks and sunlight from above.